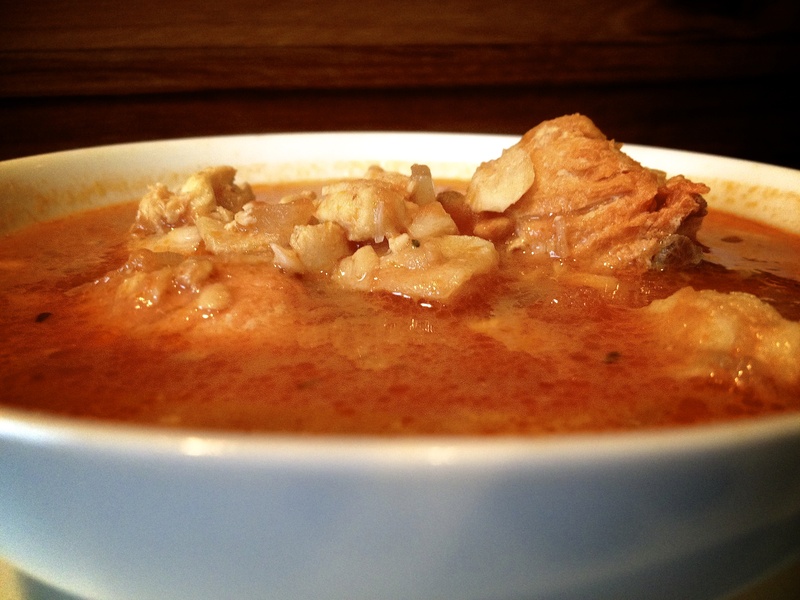 This delicious fish soup recipe was adapted from Elise Bauer’s blog Simply Recipes. As I try to mention on each page of this site (and you may be tired of hearing this) but my kids and I have food sensitivities/ intolerances to a variety of foods. Over the last nine months we have had to eliminate foods for a measured period of time before reintroducing them. It is the best thing we have ever done. You can read about it here. As a result we are re-learning how to nourish ourselves and in the process working towards diminishing our sensitivities and intolerances. All thanks to the ALCAT test and my friends who told us about it! As if it isn’t difficult enough to find appealing recipes, but then I have to consider which ingredients I can safely omit without destroying the heart of the recipe. Remarkably, the few recipes I’ve reworked from Elise Bauer’s site seem to adapt brilliantly. So in the meantime, I have to rework a lot of the recipes that I come across. Some of the time I fail miserably (not so bad that I can’t eat my flop’s, it’s just that no one else will) and other times I am genuinely surprised when my kids and husband give me five stars and proudly announce that a certain dish is restaurant quality. Blush. 1) Over medium-high flame, heat olive oil in a large soup pot. Add chopped leeks (or onions) and garlic; sautée 4-5 minutes. Add tomato and tomato paste, cooking gently for approximately 10 minutes. 2) Add dry white wine, allowing to simmer a few minutes before adding the cut fish pieces, gently stirring to cover with the tomato sauce, followed by adding the pre-heated fish stock. Simmer uncovered for a minimum of 10 minutes. Add seasonings. Note: Other fish that I like to use are Turbot, Sole, Red Snapper, Tilapia. ← We eat too much. And produce too much waste.